I remain an ardent supporter of physical media. I don’t feel like I really own an album unless I can hold it in my hands, and though I don’t always go in for every special edition (I couldn’t care less about colored vinyl, for example), I believe there’s still something very important about the artwork, the liners, the overall package. So it pleases me greatly when a band goes above and beyond to make that package into something distinctive. And when it comes to distinctive packaging, Los Angeles-based grindcore outfit Graf Orlock goes above and beyond the above and beyond. Most awesomely, their 2009 EP Destination Time Tomorrow was wrapped in an Alien facehugger, and the gatefold opened to reveal a pop-up chest-burster. 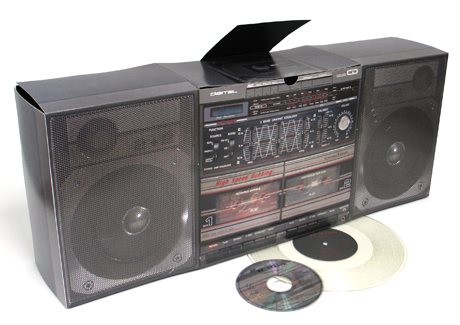 2011’s Doombox EP comes in a foldout cardboard 80s-style boombox. This new one, Crime Traveler, comes in a newspaper – a custom job, of course, written and designed by the band, and not just a copy of the Bloom Picayune that they picked up outside the Circle K. Now I have to admit that I don’t actually have this newspaper – I just got the digital promo through the interwebs. (Ironic, considering that the same internet is killing print newspapers.) Still, the point remains: Graf Orlock’s packaging is more creative and intricate than that of any other band, almost to the point of absurdity. With all of the ancillary ideas surrounding Crime Traveler, it’s easy to forget that there’s an actual album of actual grindcore involved. And it’s a pretty good record, but not the band’s best. (I’d give that prize to Destination Time Tomorrow, but I’m a sucker for a xenomorph.) Ultimately, even more than the rest of Orlock’s catalog, Crime Traveler is overshadowed by its own shtick. Still, Crime Traveler may not be the best grind that either 2016 or Graf Orlock has to offer, but it does have its moments. Like the best action films, those moments are both violent and fun. If you’re looking for crushing, you can find it in the chug of “600,000 Tons Of Explosive Ordnance,” or the blistering “Difficult Decisions In The Yutani Mess Hall,” both of which are among Traveler’s best and heaviest moments. But the rest of Crime Traveler doesn’t quite coalesce, or maybe it does and it’s just a matter of not having seen the movie to know what it’s coalescing into.